WASHINGTON — In celebration of the 50th anniversary of the first moon landing on July 20, 1969, the U.S. Postal Service is pleased to reveal two stamp designs commemorating that historic milestone. Additional details are coming about the date, time and location for the first-day-of issue ceremony. 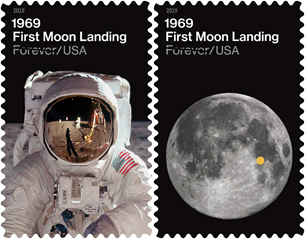 One stamp features a photograph of Apollo 11 astronaut Buzz Aldrin in his spacesuit on the surface of the moon. The image was taken by astronaut Neil Armstrong. The other stamp, a photograph of the moon taken in 2010 by Gregory H. Revera of Huntsville, AL, shows the landing site of the lunar module in the Sea of Tranquility. The site is indicated on the stamp by a dot. The selvage includes an image of the lunar module.